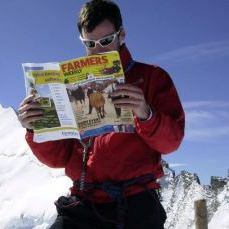 About: 28 year old farmer’s son from Northern Ireland who works for Farmers Weekly Magazine. I started life on a sheep farm in Scotland but Northern Ireland is my home. At the age of seven I was shipped off to boarding school at Headfort School in Ireland and then across the water to Shrewsbury School in England. Having developed a determined resilience to the trials of school life, I set off to Kenya to put my independence to the test. After six months living a primitive lifestyle in the bush and working on farms I returned to the UK to start my Masters degree in Geography at the University of Bristol. In 2008 I became involved with starting up a new charity called Challenge Bolivia to support education in the villages of the Bolivian Altiplano. As part of this work I ended up leading a two week expedition that involved climbing 5 x 6000m volcanoes in 5 days and delivering educational materials to the schools in the Altiplano. Back in the UK and I landed myself a job in London working for the sustainable development charity Forum for the Future where I ran a campaign educating farmers about climate change. This led me to Farmers Weekly where I’ve been managing the brand’s editorial projects and campaigns for 3 years. I am now taking a break from work to challenge myself in new and interesting ways. When I first moved to London the first thing I did was buy a bicycle. Crowded buses and tubes weren’t for me and I got to know London quicker by travelling around on two wheels. It was simply a means of getting around until Johan arrived in town. He quickly got me into the more competitive side of cycling. Lycra became a must and Strava an obsession. Having enjoyed a few long distance cycling adventures in Europe it was only a matter of time before I set off on a long-distance cycle tour. I’ve spent five year’s living a sedentary lifestyle in London offices. I don’t think I am designed to sit in offices. I might be wrong, but if I don’t try something else I will never know. So I’m not going to sit in an office for a while and see what happens. In truth this isn’t just about rhinos for me. It’s about conserving mega fauna and the natural world in general. The rhino is symbolic of a whole complicated system of conflict between humans and wildlife that has gone badly wrong. Fix the system (habitat loss, climate change, illegal trade in ivory etc) and the rhino and many other species will have a better chance of survival. I’m under no illusions that we’re going to solve these challenges on this trip but if my efforts and skills can assist those already knowledgeable in how to fix these kind of systemic problems then that is something i’d like to do. What worries you most about cycling with Johan? He eats too quickly. Finding enough food to eat and fighting Johan for my share of the food that is found are going to be two of the biggest challenges for this trip. The only thing he likes more than food is planning and organising things. Hopefully this means he will have organised emergency caches of food and water all the way along the route…! I couldn’t help myself approaching this website and finding more details after I heard your interview on BBC.I never buy rhino horn products, and I don’t think I will buy any of them in the future. From this perspective, I think you and your pal did fantastic job in raising the public awareness on this issue. I also want to say thank you for telling us your sincere impression about China. China is indeed truly remarkable. My hometown is Urumqi, the capital of Xinjing, I found some notes about it in the photo archives, unfortunately due to some internet issues, I can’t see these photos , but I believe they are stunning and beautiful.